Moving your data and your datacenter into the future. In conjunction with one of the nation's leading technical tradeshows, the Geek Day Datacenter Channel features compelling technology thought leadership on the industry's best-of-breed datacenter solutions providers. 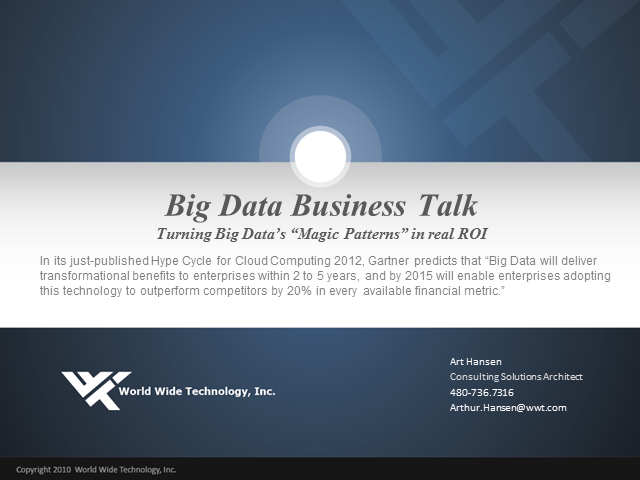 Arthur Hansen, Consulting Solutions Architect, World Wide Technology, Inc.
Who is doing what with Big Data and why – a comprehensive exploration of the major use case patterns and components of a Big Data project. Audience should be executive sponsors and technical people that are looking for ways to turn the hot topic discussion of Big Data into a discrete project with a payback for their enterprise. Webinar explores five “magic patterns” that are found in Big Data use cases highlighting how companies exploited them to create competitive advantage. Webinar discusses the elements of a big data solution including Hadoop, Machine Learning, Visualization and Storage plus ways to get started quickly. Art Hansen is current working as consulting solution architect for World Wide Technology, a 5 billion dollar company, where he is tasked with driving WWT’s SAP Hana, Big Data, and RISC migrations go to markets. Art is a former IBM award winning IBM programmer and developer who created applications for large enterprises including UPS. Mr. Hansen also has infrastructure experience having been a Technical Services Architect in IBM’s server consolidation and migration national practice out of Austin Texas. Art won an innovation award from NetApp in 2011 for efficiency with a Global SAP migration at Freeport-McMoran where they migrated from Unix to Red Hat Linux on Cisco UCS. Art graduated from Drew University with a degree in Economics and has been in the IT industry for over 20 years. Software-defined Networking and Network Virtualization: What’s the Difference? Software Defined Networking (SDN) has captured the attention of network vendors, and customers alike. The promise of SDN is a hot topic today, but the definition(s) of SDN can vary dramatically. Very often the terms Software Defined Networking and Virtual Networking are used interchangeably, but are they different, or are they the same process? In this session, we will attempt to unravel the concepts and platforms for Software Defined Networking and Virtual Networks. Dave Chandler is a National Technical Solutions Architect, Practice Lead for Core Routing and Switching for World Wide Technologies, Inc. He has 20 years of experience with WWT, Cisco Systems, 3Com and the Duke University Medical Center. His focus includes data center related topics, ethernet routing and switching, storage switching, storage technologies, unified fabric, compute platforms, virtualization and private cloud. IT professionals are often running out of power at the rack, creating hot spots and not properly managing capacity. Learn how to avoid these common issues as well as different concepts for data center design. Cool Question of the Day: Is there a simple way to compare how cooling architectures vary in performance by efficiency, opex, carbon footprint and geographical location? Data center cooling strategies are changing; cooling solution requirements have evolved significantly. ASHRAE and local codes are requiring high efficiency, “economizer” modes be used in most new data centers and expansions. While some cooling systems can save over 70% in annual cooling energy costs by operating in economizer there are at least 17 different types of economizer modes. Selecting the “best solution” can be a costly, complex, confusing process, greatly affected by location, architecture, and data center mission. Schneider Electric offers research and “trade-off tools” to simplify the process comparing cooling solution approaches. This discussion will focus on guidance provided in both White Papers and corresponding Economizer Mode PUE Calculator (available on Tools.apcc.com). Do you remember when NetApp compared their filers to toasters - as easy to set up and use as a kitchen toaster? While still cost effective and fairly easy to manage they are also offering robust, enterprise-class storage solutions. Join WWT's Rick Harper as he discusses NetApp's current line of storage arrays and how to know if they are the right fit for your environment. Join WWT's Chris Fendya as he discusses why and how companies are moving to active active data centers. The technologies and solutions that make this endeavor a reality will be reviewed along with architectural and business challenges. Mobility, flexibility (both IT architecture and business), scalability, and business continuity/disaster recovery are all realized benefits when moving to an active active data center. World Wide Technology’s Mike Voss shares best practices from the trenches on how to use a Systems Integrator or trusted partner to help guide you on your path to the cloud. Learn why asking the right questions and listening for the answers is critical to finding the right infrastructure solutions for each user’s environment. This webinar will define the attributes of Big Data and the behavior of Big Analytics that break traditional I/T infrastructure. We will explore the technologies that enable large amounts of data to not only be streamed real time but provide the processing capabilities to sort and analyze the data to gain meaningful insight.